Pushups are a simple and effective opposing muscle exercise. When you rock climb, you work certain muscle groups more than others. Climbers commonly refer to those less-used muscle groups as their opposing muscles. Most avid climbers know they should perform opposing muscle workouts to stave off muscle imbalances that can potentially lead to poor posture and injuries. Nonetheless, climbers often neglect exercising their opposing muscles. Correct this oversight by making it a goal to perform short opposing muscle workouts twice a week after climbing. Rock climbing almost always involves repetitive pulling motions. These movements routinely engage your latissimus dorsi and your biceps, among other muscles. To balance this usage, include at least one exercise that works your pectorals and triceps in every opposing muscle workout. Body-weight options include pushups and dips, while exercises using machines or weights include benches presses and chest flyes. 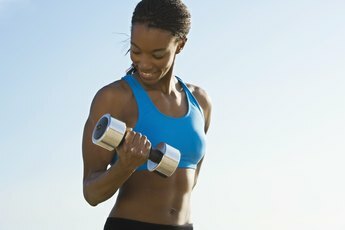 Varying the exercises you select from workout to workout can both keep your body challenged and help alleviate boredom. Your opposing muscle workouts should include exercises to strengthen your deltoids. Deltoids are the shoulder muscles involved in pressing straight up, raising your arms up in front of your body, and raising your arms out to your sides. Anterior deltoid exercises include shoulder presses, front raises and pike presses. Target lateral deltoids with lateral raises or upright rows. Reverse flyes and rear deltoid rows work your posterior deltoids. Incorporate an exercise that works each set of deltoid muscles into every opposing muscle workout. Perhaps more than any other motion, climbing involves repetitively closing your fingers on handholds and maintaining that hold on them throughout each move you make. This grasping motion primarily works the muscles of your inner forearms, called wrist flexors. Balance this usage by including reverse wrist curls in every opposing muscle workout. Reverse wrist curls will strengthen the muscles of your outer forearms, known as wrist extensors. Exercise your opposing muscles twice a week after climbing. Each workout should include five or six exercises covering all major opposing muscle groups. The American College of Sports Medicine recommends performing two to four sets of eight to 12 repetitions of each exercise. You should feel fatigued and unable to perform another rep by the end of the final set. 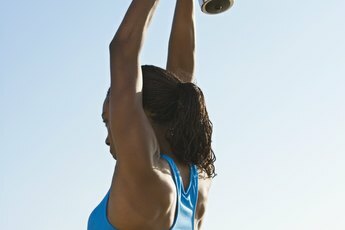 Stretch these muscles along with your climbing muscles after you complete your workout, as suggested by MayoClinic.com.